Outfit your entire rig with Siskiyou. The PC series perfusion chambers have embedded magnets that are conveniently located to retain perfusion plumbing and ground plugs. They are designed to fit into our 8090c fixed stage platform. A standard 22 mm cover slip is used to create the chamber bottom that is attached with vacuum grease, silicon, or parafilm (use a heat gun to gently melt the parafilm). There are two plastic retention screws for added security. Both openings accept 13-mm round cover slips for cultured specimens. PC series chambers come in three styles: horizontal, vertical, and round. All models have two small but very powerful magnets located next to the input/output reservoirs and two more located closer to the recording chamber. The location of these magnets securely hold your perfusion plumbing or ground wiring close to the final location. The 8090c perfusion chamber platform is specifically designed with the electrophysiologist in mind. With adequate mounting holes and a drainage trough around the perimeter for solution overflows. The 8090c is ideal for fixed stage electrophysiology setups. The drainage trough is designed to protect your expensive microscope optics by funneling the solution to the outer edge of the platform and down the drainage tube to a safe location. The chamber receiver is located off of center and accepts our PC series perfusion chambers. 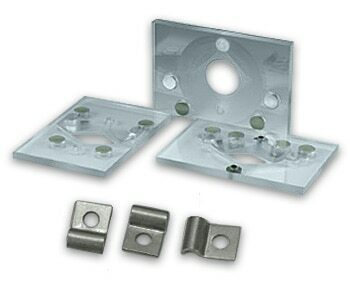 Clearance holes along the right and left hand edges allow mounting as a stand-alone fixed stage or as the center chamber platform in a bridged platform setup. 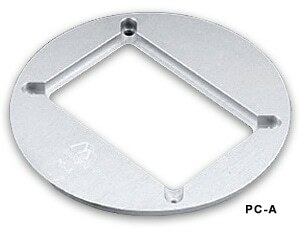 The PC-A chamber adapter allows the user to mount our PC-V and PC-H chambers into our 8090P platform. Their 10.8-cm diameter is also compatible with Olympus microscope stages and allows 360° rotation of the chamber. Perfusion chamber, holds 35mm & 50mm Petri dishes (Corning Brand ONLY), or 25mm x 75mm glass slides. A package of 5, clips only.